Back in the 1970s, Jack Webb of Dragnet fame created something he called Project UFO. It was based on the files of Project Blue Book and it was difficult to recognize the cases presented. The attitude of the program, if I remember it correctly, was to examine a case that might have been inexplicable and find a rational and reasonable answer before the hour expired. Although I was excited about the show, I was quickly disappointed in the final product. It reeked somewhat, again if I remember correctly, of a debunking operation. This new incarnation, given the snappy title of Project Blue Book, seems to be at the other end of the spectrum. It suggests a grand conspiracy that involves what most of us believe is the mythical MJ-12, Air Force officers who will go to about any length to prove a case has a terrestrial explanation and a hint of the Men in Black. In other words, it is filled with the paranoia of the UFO field and has very little to do with the reality of the situation as it was then or as it is now. 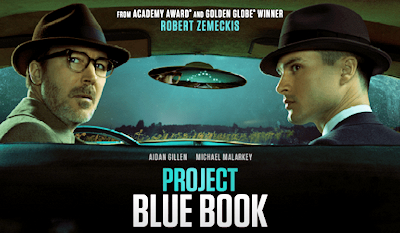 While it is suggested that it is based on the history of Project Blue Book, very little of what I saw was based on that. About the only things that were accurate were the names of some of the people such as Dr. J. Allen Hynek and Project Blue Book. Once beyond the superficial, we plunge headlong into the fantasy that has grown up around UFO investigation. In one scene, a general walks into an office that is reminiscent of Fox Mulder’s FBI office filled with photographs, newspaper clippings and drawings of alien creatures. Since this is the beginning of Hynek’s association with Blue Book (Project Sign actually), some of the material there is out of place. It shouldn’t show up for years. And while I’m in a nitpicking mood, I’ll note that the military customs and courtesies are simply misunderstood. The civilian show runners and directors don’t understand saluting and get it wrong. You have an Air Force captain referring to Hynek as “Doc,” which seemed to be a little disrespectful. And the uniforms seemed to be a combination of Army and Air Force, meaning that elements of Army uniforms showed up on the Air Force uniforms. As I say, nitpicking. The real trouble here is a suggestion that the stories are grounded in reality but I fear it is a reality driven by every paranoid rumor, half-truth and fantasy that has infected the UFO community since the 1940s. I just had a hard time getting beyond all of that. I was hoping for something that had a little more of a documentary atmosphere, not something that was invented for a story that has little to do with the history of Blue Book. Lt. George Gorman on the left. In other words, as Jack Webb had done decades ago, we have a show that is “based” on the truth, but that moves into fiction immediately. I was quickly disappointed again. However, this time, I recognized the case that began the tale without having to have the producers tell what it was. 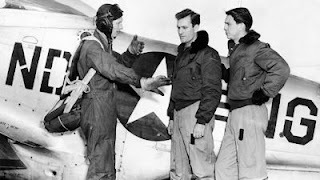 The opening sequence and the investigation are wrapped around the October 1, 1948, sighting by Second Lieutenant George Gorman, an Air National Guard pilot, on a routine night flying mission near Fargo, North Dakota. In the show, he buzzes a football stadium, climbs out and spots something, a glowing ball in the distance. He attempts to intercept, chases it, is apparently hit by it, and open fires on it. Once he lands, he is more than a little crazed by the events and for me, talks gibberish. He is suffering from an acute case of PTSD and eventually ends up in the psycho ward before being given a shot and dragged off. Apparently, the shot will wipe out his short-term memory of the event. Hynek is called in to investigate and walked over to where the plane is being examined. He is stopped by a military guard but Hynek gives him the facts of high-altitude radiation and then is allowed to not only examine the plane but to sit in the cockpit. The guard should be reprimanded because he didn’t know that Hynek was authorized to see the plane and shouldn’t have allowed him close to it. After the captain with Hynek told the guard that Hynek was authorized to examine anything he wanted should the guard allow him to pass. But really, all of this is trivia. If you understand that this is a television drama and not a documentary, that they were not constrained by what really happened, and that they are creating situation to move the plot, then the show is enjoyable. Maybe I nitpick a little too much, but that’s half the fun for me. I am interested in where the show is going and how many elements that have nothing to do with Blue Book will be brought in. I suspect they are going for an X-Files vibe as opposed to an actually historical vibe. After the initial peel off, I realized the speed of the object was too great to catch in a straight chase, so I proceeded to cut it off in turns. At this time my fighter was under full power. My speed varying between 300 and 400. The object circled to the left, I cut back to the right for a head-on pass. The pass was made at apparently 5000 feet, the object approaching head-on until a collision seemed inevitable. The object veered and passed apparently 500 feet or less over the top above me. I chandelled [a flight maneuver] around still without the object in sight. The object made a 180 degree turn and initiated a pass at me. This time I watched it approach all the way as it started to pull up, I pulled up abruptly trying to ram the object until straight up with me following at apparently 14,000 feet, I stalled out at 14,000 feet with the object apparently 2000 feet above me circling to the left. We made two circles to the left. The object then pulled out away from me and made another head-on pass. At this time the pass started and the object broke off a large distance from me heading over Hector Airport to the northwest at apparently 11,000 feet. I gave a chase circling to the left trying to cut it off until I was 25 miles southeast of Fargo. I was at 14,000 feet, the object at 11,000 when I again gave the aircraft full power… to catch it in a diving turn. The object turned around and made another head-on pass. This time when pulling up, I pulled up also and observed it traveling straight up until I lost it. I then returned to the field and landed. Although the program suggested that Gorman had fired on the object and that his aircraft had been damaged by it, there is nothing in the Blue Book files to corroborate that. This is artistic license, I suppose, but it is important to note that this was an aspect added to the story. I am further convinced that the object was governed by the laws of inertia because its acceleration was rapid but not immediate and although it was able to turn fairly tight at considerable speed, it still followed a natural curve. When I attempted to turn with the object I blacked out temporarily due to excessive speed… I do not believe thee are many pilots who could withstand the turn and speed effected by the object, and remain conscious. In the tower, L. D. Jensen, said that he had seen the object or light at about 1000 feet in the northwest, pass rapidly over the field, flying in a straight line. He could see no form or shape, even through binoculars, and he could not see the maneuvers of either the F-51 or the object. Officers from Project Sign, the forerunner of Blue Book, arrived from Ohio and interviewed all the witnesses. Eventually, after an investigation that included testing Gorman’s aircraft for radiation [which might have had more to do with the altitude and cosmic radiation rather than alien spacecraft], they concluded that Gorman had engaged in a dogfight with a balloon. Dr. Donald Menzel believed that Jupiter had a role in the dogfight as well. The official answer in the Blue Book files is balloon. Though some knowledgeable students of the UFO phenomenon… have rejected such an explanation for this famous sighting, unlike some Air Force would-be solutions this one seems plausible, particularly in the light of the failure of ground witnesses to confirm the extraordinary performance Gorman ascribed to the object he was pursuing After the Mantell incident [in which another Air Guard pilot was killed chasing what turned out to be a balloon], the Gorman sighting may be the most overrated UFO report in the early history of the phenomenon. I will note here that Clark is more liberal than I when it comes to UFO sightings and explanations, so his conclusion here carries extra weight. I agree with him. Gorman somehow tangled with a balloon. There is one final point and that concerns the over reaction of the pilot in, dare I say it, the pilot of Project Blue Book. There is no evidence Gorman was completely freaked out over the encounter. True, he had trouble landing the aircraft, but that was the reaction of the encounter. It was not a long-term problem. He remained in the Air Guard and retired as a lieutenant colonel in 1969.